The explosive Broadway hit "American Idiot" will be presented in Los Angeles next spring as part of Center Theatre Group/Ahmanson Theatre's 2011-2012 season at the Los Angeles Music Center. The 2010 Tony Award-nominated Best Musical, called "thrillingly raucous" and "emotionally charged" by Charles Isherwood of The New York Times, will be presented March 14 through April 22, 2012, at the Ahmanson Theatre, with the opening set for March 16. "American Idiot" features the music of Green Day and the lyrics of its lead singer Billie Joe Armstrong, and recently won the 2010 Grammy Award for Best Musical Show Album. The book is by Armstrong and Michael Mayer, and direction is by Tony Award-winner Mayer ("Spring Awakening"). Choreography is by Olivier Award-winner Steven Hoggett ("Black Watch"), and music supervision, orchestrations and arrangements are by Pulitzer Prize-winner Tom Kitt ("Next to Normal"). The Tony Award-winning set design by Christine Jones and the Tony Award-winning lighting design by Kevin Adams will also be featured at the Ahmanson. Nominated for three Tony Awards, "American Idiot" is the story of three boyhood friends, each searching for meaning in a post 9-11 world. Through incredible spectacle, thrilling performances and with the hope embodied by a new generation, "American Idiot" has given Broadway audiences the time of their lives night after night since the musical began performances at the St. James Theatre in March 2010. "Since its inception, audiences have been surprised by the emotional journey the show takes them on, told almost exclusively through Green Day's songs, including many they are already familiar with and love," said Tom Hulce, producer. "This is such a potent time for oucountry and the search of our characters for what to believe in is gorgeously celebrated through Billie Joe and Green Day's wonderfully lush score," he added. "I am so happy that Los Angeles audiences will have the chance to see this audacious musical at the Ahmanson," said Michael Ritchie, CTG Artistic Director. "'American Idiot' speaks directly to anyone who is at the cusp of adulthood, but those who have passed through it will also recognize the power of this remarkable piece of theatre." The musical features the hits "Boulevard of Broken Dreams," "21 Guns," "Wake Me Up When September Ends," "Holiday" and the blockbuster title track, "American Idiot" from Green Day's 2004 Grammy Award-winning, multi-platinum album, plus several songs from Green Day's 2009 album release "21st Century Breakdown," and an unreleased love song, "When It's Time." 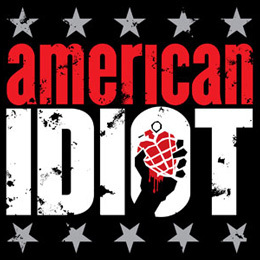 "American Idiot" premiered at Berkeley Repertory Theatre in September 2009 and played through November of that year. In April 2010, the musical opened on Broadway where it continues today. "American Idiot" joins the previously announced West Coast premiere of "Bring It On: The Musical" in CTG's 2011-2012 season at the Ahmanson. The rest of the season will be announced shortly. Season ticket subscriptions for the Ahmanson Theatre will be available in March. For additional information, please visit www.CenterTheatreGroup.org/Ahmanson.